A walk on the beach is only a bite away! 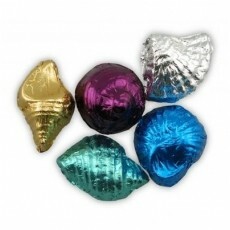 0.96 oz Cello bag filled with 5 assorted mini chocolate shells. Mix and match foil and flavor colors for no additional charge. Tied with ribbon color of your choice.